Monday August 21, 2017: Sonny asks Paul to marry him, Chad asks Abigail to marry him, and John breaks into Bayview Sanitarium. At SPD, Paul’s anxious to get Sonny home to himself but Sonny has something important to ask. Justin rushes in saying Sonny’s free. The men embrace, happily. Sonny wonders where his mom is. Sonny thanks his dad and the guys take off. At the hospital, Chad asks Abigail to marry him. Unsmiling, Abby says, “There’s a lot to think about.” Chad doesn’t want to waste time. Abigail says it sounds wonderful but she can’t marry him. She’s still married to Dario. Then she starts to laugh at him and says he can’t take a joke. She hugs and kisses him. He almost passes out at the cruel joke. Of course she wants to marry him! She admits she didn’t get intimate with Dario. They celebrate being engaged and Chad rushes off and returns with her engagement ring. At the Brady’s pub, Kate kisses Roman just as Andre walks in. He watches, looking tense and then leaves as the two break free. “Hold on,” Kate says. “What are we doing?” Roman grins. It seemed obvious to him. She’s puzzled – after all this time…They chuckle and Roman admits he thought his life was full but he wants love in his life. They had something special, which was taken from them. Will she try again? He caught her off guard. He thinks John punching him in the head jogged something loose. She laughs. They reminisce about Roman’s proposal and short marriage. They’d still be together if it wasn’t for Andre. Kate says they don’t know that. She has to go. Once she’s gone, a smile plays upon Roman’s face. Marlena struggles in her straitjacket at Bayview, wishing John would hurry and come for her. John goes to Salem Inn asking “Marlena” to open the door. He’s not going away. Inside, Hattie wrings her hands and tries to summon calmness. She opens the door and he says, “You kissed Roman?” John can’t abide by this separation and asks what’s going on. She calls him a “second rate Roman Brady,” a stand in. She tells him it’s over and to accept it. He refuses. At the Kiriakis mansion, Nicole starts having memories of holding the cursed amulet the night she was drugged. Brady asks if she’s okay. Nicole doesn’t think Eric took it from Deimos. “I was in Eric’s room. I was the one holding the amulet.” She recalls looking for Eric after he left his room that night but finding Deimos instead. He was mocking her and she had a knife. Deimos told her she didn’t get her baby back because he made it happen, he bribed the second judge. In Nic’s recollection, Deimos mocked her, calling her an unfit mother. He told her he was going to leave Salem that night with Holly, “My daughter.” Nicole was in shock. Deimos handed her the amulet and cursed her to a barren, childless existence. She and Deimos struggled when the knife went in his gut. “Oh God,” exclaims Nicole. “I did it. I killed Deimos.” Brady questions what she recalls and she explains it all. “I stabbed him.” She then remembers taking the amulet and leaving. She flung it across Eric’s room when she got upstairs. Brady confirms that’s where he found it. He promises she isn’t going to prison. Nicole cries. Anjelica finds Bonnie shopping at Horton square and berates her. She’s supposed to be at Sonny’s hearing. Sonny’s name doesn’t ring a bell. “Your son,” Anj says, and Bonnie rushes off. Hattie calls and as she’s packing, she tells Anjelica she’s done with this whole scheme, and leaving Salem. She tells her what happened with Roman.”He just turned me out like a muskrat at a gopher conv ention.” Anjelica has no idea what that means but urges Hattie to hang in there. Bonnie walks into SPD. Justin says she just missed Sonny and Paul. Justin tells her that their son has been released. Bonnie takes a moment to register and then feigns happiness and hugs Justin. She tells him she broke up with Lucas and wants Justin back. Justin’s dumbfounded but this is all he has ever wanted. They embrace and kiss. Hattie leaves Salem Inn with John tailing her all the way to Bayview and to Marlena’s room. He sees Hattie go and Marlena in a locked room and unlocks the door, rushing in to hug Doc. He knew something was amiss. He goes to untie her straightjacket and Hattie locks them in together. Sonny and Paul wind up in bed at the Kiriakis mansion. 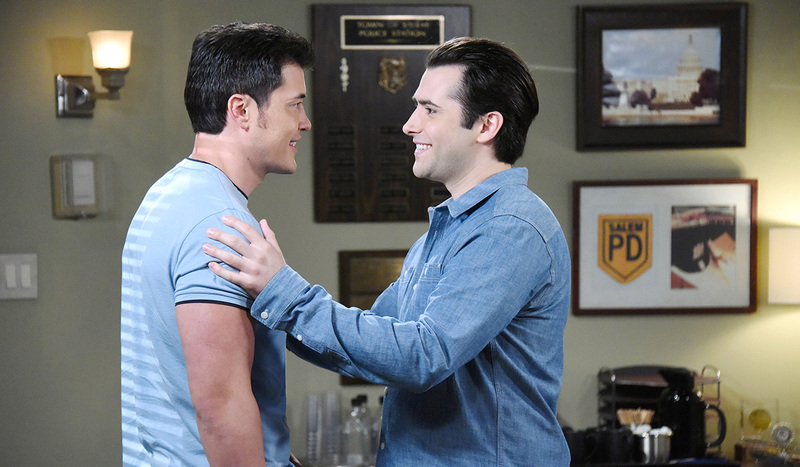 Sonny admits that before his father interrupted them at SPD, he was going to ask Paul to marry him. Paul’s shocked. Sonny asks, “Paul, will you marry me?” Paul laughs and says, “Yes! Yes.” They kiss. Kate arrives at the DiMera mansion. Andre asks what she’s been up to. She tells him she’s been in meetings. Andre gives her a look. Joey says goodbye to Salem.